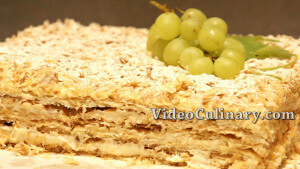 Napoleon cake (mille-feuille) is made of puff pastry layers, filled with Diplomat Cream or German Buttercream (pastry cream lightened with whipped cream or butter). 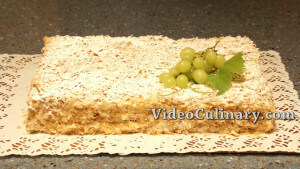 Napoleon is one of the most popular and loved cakes worldwide, although its exact origin is unknown. 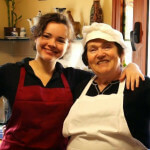 There are many recipes and versions for Napoleon; Grandma Emma and Leon are happy to share their Russian style recipe. 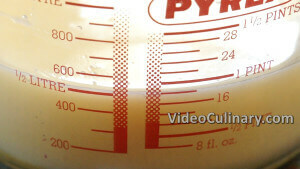 Make the quick puff pastry dough: Place 2 eggs in a measuring cup. Add one teaspoon of salt and 1.5 tablespoons of vinegar. Add approximately 220 ml (7.5 fl oz) of ice cold water and mix well. In total, we should have 375 ml (12.5 fl oz) of liquid. Place in the fridge. Sift 750 grams (27 oz) of flour onto the table. 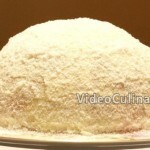 Grate 600 grams (21 oz) of frozen butter or margarine into the flour, mixing the butter with flour frequently. Make a well, and pour in the liquid and mix. Don’t knead the dough. Fold it onto itself: lift the sides and fold towards the middle, creating layers. 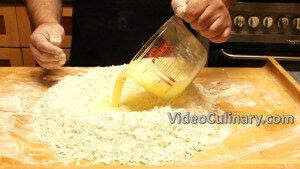 Gather any pieces of dough left on the table, and add them to the dough. Shape into a rectangular, wrap with plastic wrap or place in a plastic bag. Refrigerate for at least 2 hours. It is best to refrigerate the dough for 10-12 hours before using. 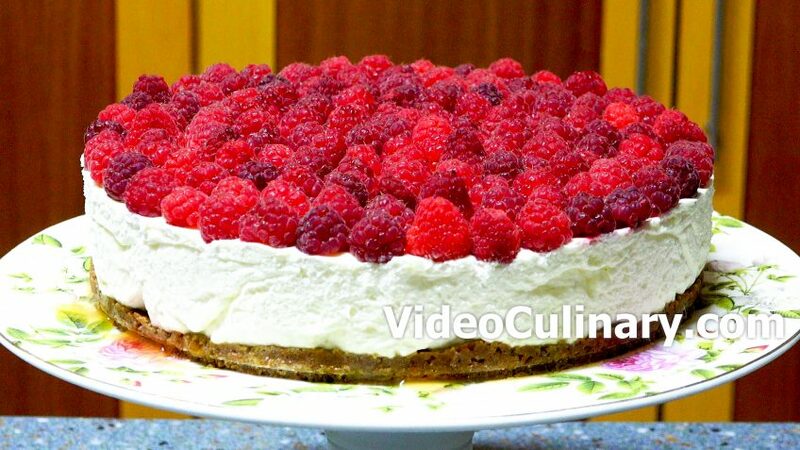 Make the pastry cream: Combine a liter of milk (1 quart) and 300 grams (11 oz) of sugar in a saucepot. Place over medium heat and stir until the sugar dissolves. Bring to simmer. 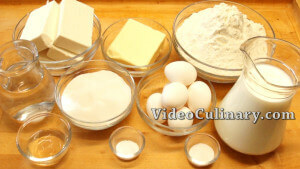 In the meantime, mix 4 eggs with 120 grams (4 oz) of flour or cornstarch and mix. Gradually add the hot milk into the egg mixture, stirring constantly. 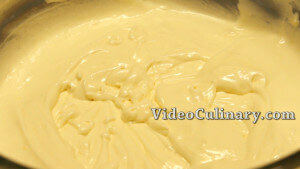 Return the mixture to the saucepan, and continue cooking the cream, whisking constantly, until thick. Remove from the heat. Add 20 grams of butter and stir until melted. Transfer to bowl, cover with plastic wrap directly on the surface of the pastry cream to prevent a crust from forming, and cool completely. Remove the dough from the fridge. Divide into 3 parts, 2 equal pieces and a smaller piece . We are going to bake 2 layers in a 60 x 40 cm (24 x 16 inch) baking tray and divide each layer in half. The smaller piece of dough will be used as crumbs for decoration. If the size of your baking tray is 30X40 cm (12 x 16 inch), than bake 4 layers accordingly. 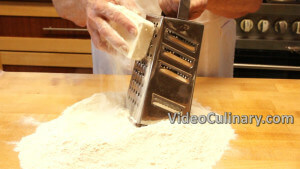 Dust your working surface and your rolling pin with flour. 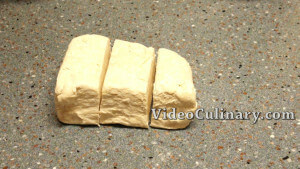 Roll one piece of dough into a 3 – 4 mm thick rectangle that fits your baking tray. Wipe the baking tray with a damp cloth and use your rolling pin to transfer the dough to the pan. Gently press the edges to the pan. Trim the edges. Add the dough trimmings to the smaller piece of dough. 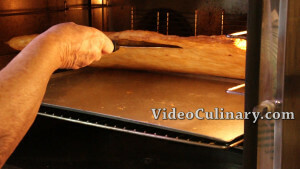 Make small incisions using a knife and bake in a preheated oven at 200-220°C (390-430°F) ) for about 20 minutes. To test for doneness, insert a spatula under the edge of the dough. Lift gently. 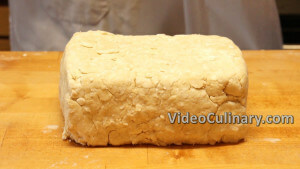 If the dough stays flat across the bottom, and doesn’t bend or break in the middle, it’s ready to come out of the oven. Remove from the oven and cool. 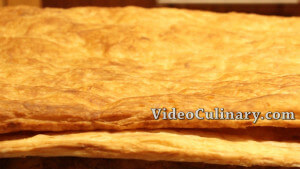 Repeat with the second piece of puff pastry. Bake the third piece for a longer time, we want it to be completely dry and easy to crumb. 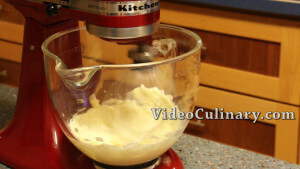 Make the custard buttercream: Place 300 grams (11 oz) of soft butter in the bowl of a stand mixer. Whip until fluffy and light. Gradually, add the custard into the butter, a tablespoon at a time. Add 10 grams of vanilla sugar, or a few drops of vanilla extract, and continue whipping until light and fluffy, scraping the sides of the bowl once or twice. 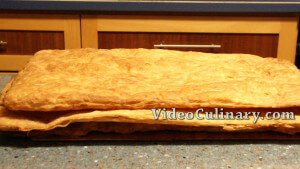 Assemble the cake: Cut each crust in half, to get 4 layers of 30 x 40 cm (12 x 16 inch). Spread ¼ of the cream over a cake layer. 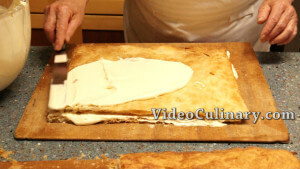 Place a second layer on top, flat side facing up, spread the ¼ of the cream evenly and continue layering. 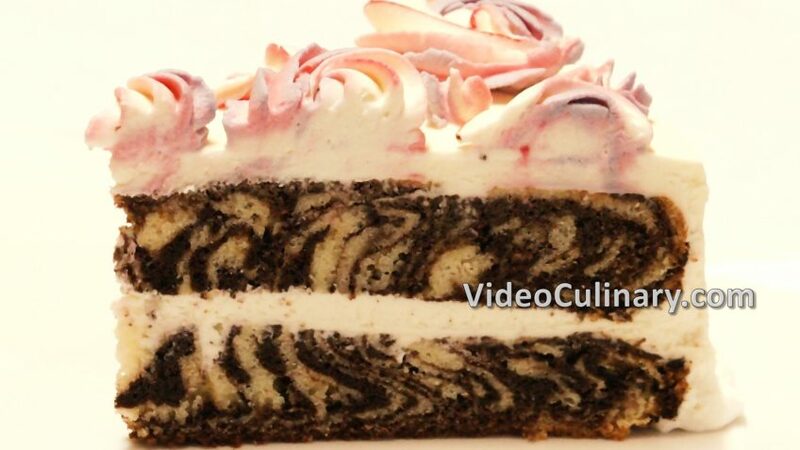 Place the final layer on top and cover the top and sides with the remaining buttercream. Crumble the smaller sheet of puff pastry into crumbs, and mix with vanilla powdered sugar. Visit our website to find a powdered sugar recipe. Sprinkle over the top and sides of the cake. Sprinkle powdered sugar over the top of the cake. 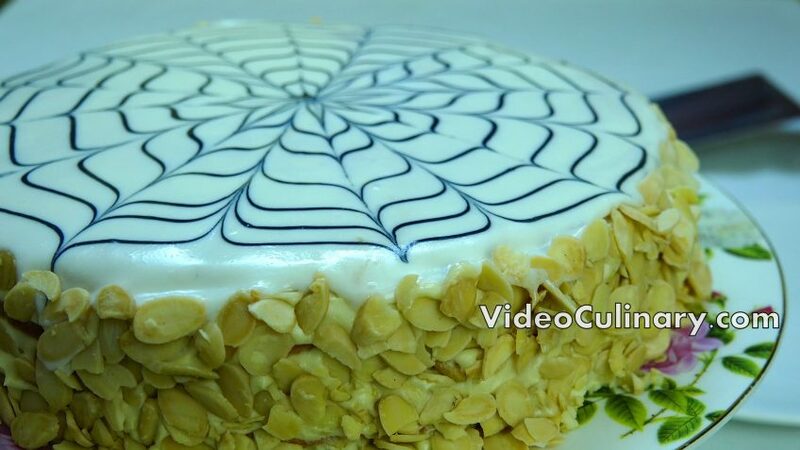 Transfer the cake to a serving plate, or cut into pieces and serve as individual slices. 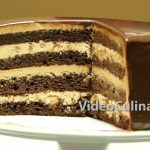 It is best to use a serrated knife to cut Napoleon cake. 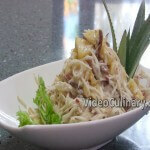 Place in the fridge, and remove an hour before serving. Enjoy!